How do you select the correct water temperature for laundry? 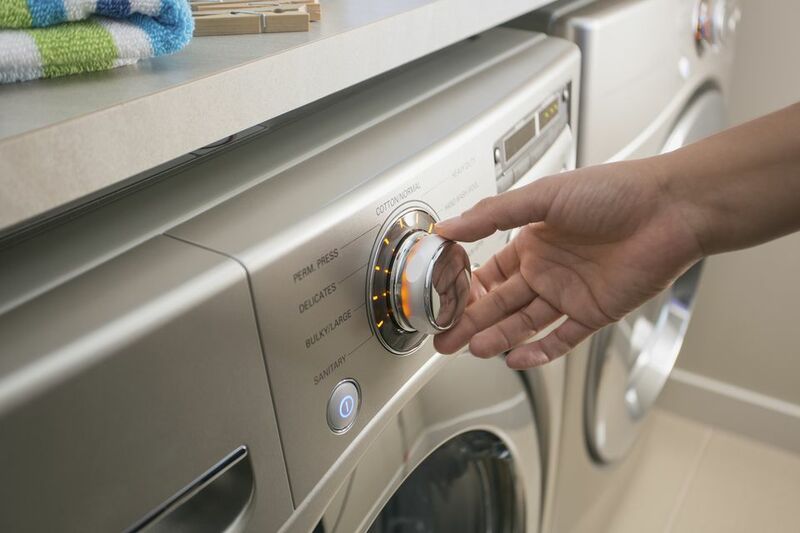 Most people don't give those dials or settings on the washer a second look. We set them once and never change the load size, type of cycle or water temperature. That's a mistake that not only wastes money spent on utility costs but can leave clothes filled with odor-causing bacteria, makes clothes look old before their time or can even ruin them. Take a minute to read the care labels on each piece of clothing. You'll find the information you need to choose both the best water temperature and the type of washing cycle. Following the recommendations on the label is especially important if you are a laundry novice or if the garment is new. After you've checked the labels, it's time to sort the dirty clothes by color, fabric weight, and washing temperature. You'll have much better results in controlling lint, removing soil, and preventing color transfer if you wash similar types of fabric together. If the label is missing or unclear, wash soiled clothes, particularly colored clothes, with cold water. Using the cold water setting will cause the least damage to fabrics like shrinking, fading or color bleeding. If you are not satisfied with the stain removal results, you can then move on to warm or hot water. Once you have some experience under your belt, you'll find that some fabrics can be cleaned at more than one temperature. One tip that works with all wash cycles and types of fabrics, is to use a cold water rinse. Rinse water has little effect on stain removal or cleaning; so cold water works just as well to rinse away detergents and suspended soil. Set the washer dial on cold rinse and leave it for every load. You'll save money by not paying to heat the water. Generations thought that hot water was the only way to get clothes clean (remember clothes were once boiled in a big pot for hours). But progress has brought us different types of fabrics, much better washing machines that use mechanical action to remove soil, and far better laundry detergents that use surfactants and enzymes to lift and remove soil from fabrics. Commercial laundry detergents can be safely used in any water temperature; however, results may vary. For best results when using lower water temperatures, choose a heavy-duty detergent (Tide and Persil are leading brands) to remove heavy soil. Lower priced detergents just don't have enough cleaning ingredients to get clothes really clean in cold water. There are still times when hot water is needed to give the cleaning and sanitation results you need. Follow this water temperature guide for laundry. Problems: Less efficient for removing stains; will not sanitize clothes. For best results with cold water washing, pretreat stains before washing. Use a heavy-duty, enzyme-based liquid laundry detergent or one formulated for cold water. Allow heavier soiled items to presoak in the water/detergent solution to give the solution more time to break apart stains from fabrics. What Are the Differences in Washer Water Temperatures? In most clothes washers, the hot water setting is 130 degrees Fahrenheit (54.4 Celsius) or above. Check your washer manual and your home hot water heater settings for specifics. If you have a washer with a steam cycle, that will increase the temperature in each load. The warm water setting is between 110 and 90 degrees Fahrenheit (43.3-32.2 degrees Celsius). And, the cold water setting is between 80 and 60 degrees Fahrenheit (26.7-15 degrees Celsius). During the winter, outdoor temperatures can greatly affect cold water temperatures. If the cold water drawn into your washer is below 60 degrees Fahrenheit (15 Celsius), powdered detergents will have a difficult time dissolving leaving white residue streaks and clothes are unlikely to be cleaned very well.